I love to add at least a little Christmas decor to pretty much every room in the house. And since Christmas is such a magical time for the kiddos, giving them a little bit of their very own Christmas fun is important. This year I decided to put wreaths up in the kiddo's rooms...and boy! were they ever excited. The boys' room sports this wreath with a burlap-y red bow. Then since I am planning on finally making matching stockings for the whole clan, I put these cute stockings (that I purchased when we just had One and the Princess) up on their beds. The stars really go with the feeling of their room. In the Princess' room, I stuck to her existing color scheme by using pink accents on the wreath rather than traditional red. (And if I hadn't been trying to decorate on a budget, I probably would have found a wreath that was a little more yellow-green, but I was aiming to use what I had.) I added another cute little bird made out of fabrics already used in her room. (I plan on making some sort of Pottery-Barn-Kids-esque mobile with this birdie and some birdie buddies after the holidays.) Then I added a pink bow. And because my daughter is the Princess, she wanted a little bling, so I added a few pink beads and berries to complete the look. So fun! And for the Inspire-me Tuesday part of my post...you have simply got to pop over and see these darling (and excessively creative) tassels that Holly from Holly's Haven has created from baby shoes her youngest has outgrown. (Okay, so she's my kid sister, but she is truly one of the most creative people I know!) 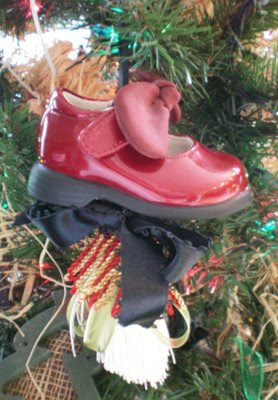 And the idea of hanging them on the Christmas tree...pure genius! I've got to go see those tassels now - that is sheer genius! just lovely I love your daughter's wreath. I love the wreaths in the rooms..that sweet little girl one is precious! What a creative way to use the shoes they don't wear..so cute!!! How sweet are those shoes? The kids rooms are cute too. I bet your kids feel so special to have their own Cmas decorations. One of my favorite things when I was little was that we each had our own little tree. It was so fun! I LOVE the decorations in your childrens' rooms!! CUTE!! I am soo flattered that I insired YOU!! :) Thank You! Love all of the cute decorating for the half pints. The princesses wreath has got to be my favorite this time. It is just so fresh and adorable. The kiddo's rooms look fab and festive! I love all your little touches. The wreaths look great in the kids' rooms! What a great mom!!! I used to put little miniature Christmas trees in my kids's rooms...and you're so right...what a thrill to have a little Christmas in their very own rooms. Also...I love your tree below! So, so precious. I noticed the amazing color on the walls behind it. WOW...what a statement! Really Great Wreath! So Cute! Oh my! I love the shoe idea! I wish I'd have been thinking to do something like that when my daughters were small! Wonderful ideas! I love how you decorated the kids rooms. I am trying to spread my holiday decorations through all of my house instead of just the living room and family room. What inspiration!! The shoes......I love that idea! Do you have a link for the pattern you used for the bird? It is so sweet! Your Christmas decoration is simple but attractive, I like it.